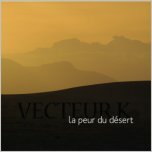 VECTEUR K - "La Peur du Desert"
I really doubt there will be much here for most A-I readers to get into. The style is a basic melodic progressive rock of moderate complexity, definitely leaning more towards neo-prog-rock than any kind of exploratory, abstract or innovative music... stridently played but unoriginally executed. Most songs have lyrics, all sung in Quebecan. The singer at times almost sounds like a French Steve Perry. Things are heavy enough at times to get away with the term "neo-prog-metal". There is the occasional pleasing instrumental passage but this is pretty hackneyed stuff for the most part, and you're not likely to return to those rare moments due to the general style of the material (especially the vocals). There's the expected amount of mellow acoustic balladry. A bit of fusion here, a little funk there. Of course, the combo's musicianship is adequately adept, though I'm noticing when I use that phrase it's almost always a drag of an album... or just not my kinda beverage.